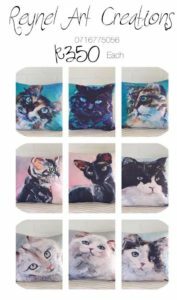 Welcome to Reynel Art Creations and thank you dear reader for the interest in my range of kitty scatter cushions. There are 12 kitty designs to choose from. They are numbered from 1 to 12 to make the ordering process easier although each of them have a name. These are examples of what the designs look like as pillows. The kitty scatters are not hand painted. 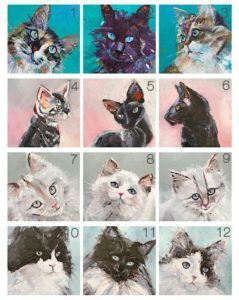 I have chosen 12 of my kitties I originally painted in oils on canvas board to be digitally printed on fabric. The scatters are made from this fabric. The scatters are colour-fast. The colour is fixed into the fabric at 200 degrees Celcius and it doesn’t behave like a dye which can wash out. The scatters are 450 x 450mm which in South Africa is a standard size. The inners are filled with feathers but if you are allergic you can request non feather inners. The pillow cases close with a zip at the back for easy removal of the inner on wash day. Delivery takes between 3 and weeks. Please order well in time if you have a special occasion coming up and your scatters are meant to be a gift for someone. We need time to manufacture your order. The scatters are R350 each plus courier costs to your door (South Africa only) of R150. If you are located outside of the borders of South Africa we will get you a quote on postage or courier costs. To order some information is needed. Kindly WhatsApp the following to Reynel at 071 677 5056. The numbers of the specific kitty designs you want to order. An invoice with banking details will be emailed to you. As soon as proof of payment is received your order will be forwarded to the manufacturer and the manufacturing process will be started. When the courier collects your order at the manufacturer you will be provided with a waybill number. If you are not happy with your order your money will be refunded (except the courier cost) if you return the scatters (at your cost) in the same condition as you received them in. If you have any other questions kindly WhatsApp Reynel on 071 677 5056.